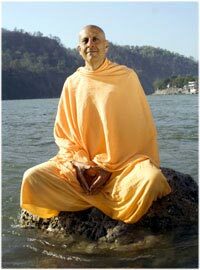 Radhanath Swami was born in Chicago in 1950. In his teenage years, the longing for knowledge about God lead Radhanath Swami as young Richard Slavin on a journey throughout Europe and the Middle East, during which he undertook a careful study of the scriptures of Christianity, Judaism, and Islam. 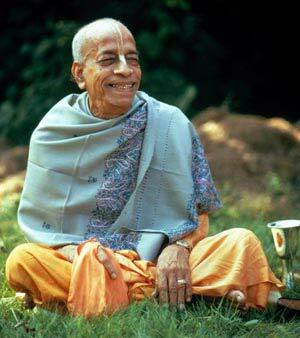 This journey ultimately led him to India, where he lived for several years, and met Srila Prabhupada, Founder of International Society for Krishna Consciousness (ISKCON) and the Hare Krishna movement in the west. By choosing A.C. Bhaktivedanta Swami (1896-1977), a spiritual activist, as his guru, Radhanath Swami cast his fate to the wind, cut his matted locks, and entered back into the society. "Moon is like Soul. Clouds are like all the situations in our life, relationships, youth, etc. Wind is like the Time. Just like the wind moves the clouds, Time moves all the situations in our life. But the soul is always the same and not on the temporary situations. One who focuses on soul is a moon-like person...."
When there is love in your heart only love will come out. When power comes, along with that comes responsibility to protect innocent. We get experience not through mechanical devices but through our eagerness. When our foundation is in harmony with the laws of nature we will live in harmony with our eternal nature. The joy of bhakti is experienced to the degree we are selfless in our efforts. Remembrance is a necessary expression of love, internally. The auspiciousness of any situation is how it brings us closer to Krishna.